Sometimes, when you play La Salle, you only get one chance. The Far Eastern University Lady Tamaraws sent their Final Four encounter with the Lady Spikers to a win-or-go-home match and save for certain stretches, they didn’t really show up. During their first round meeting, La Salle swept FEU in three sets (25-15, 27-25, 25-21). In the second round, La Salle took the first two sets after which FEU won the next two to set up a fifth set in which they faltered. They seemingly gained confidence that they can play La Salle because in their Game One encounter in the semifinals, they lost the first two sets after which they rebounded to take the next three. Now with a chance for the biggest upset of the tournament, they could have taken the second set from DLSU after which they led, 22-19, only to squander it and lose it in three. La Salle advances to their eighth consecutive women’s volleyball finals while FEU is done for the year although they should feel good about themselves. La Salle was good when they needed to be good. The Lady Spikers played well in stretches but when they needed a point, they not only got one but they got them in bunches. The reason why I said in stretches, remember that part when DLSU head coach Ramil De Jesus pointed out that his girls were merely waiting for FEU to commit an error as opposed to taking the game to their faltering foe? Twice that happened — in the second and the third set. However, the reminders were timely as La Salle responded to close it out. The Lady Spikers' serve was fantastic and once more they got a lot of contributions from many players — Ara Galang, Mary Joy Baron, Kim Dy, Cyd Demecillo, Mika Reyes, and of course, the person who drives their lean green machine, Kim Fajardo. Fajardo without a doubt is the best playmaker in the league and perhaps the best in the country right now. She has great instincts, vision, and packs a mean serve. Now when you play La Salle, you cannot have one or two players simply playing well because the Lady Spikers always get a lot of contributions from different players. FEU, not at their best, looked tentative, overwhelmed, and intimidated. La Salle wasn’t at their snarling best but they got enough in the faces of their FEU counterparts. The Lady Tamaraws’ response? Chin Basas, who can be snarky with opponents, didn’t respond because she of her poor game (along with Bernadeth Pons’ subpar performance). Without Pons and Basas providing scoring sock, FEU looked for a source of inspiration on the floor. There was a brief moment when the unlikely Heather Guino-O served three consecutive aces to give FEU a 22-19 second set lead. Remy Palma had that moment where she looked La Salle’s way after a point but now you know the Lady Spikers’ were in FEU’s collective heads because a reaction is what they want to provoke more so if it’s not in your game style. Now if they had taken the second set there is no telling how the match would have gone. But that crucial substitution for Gyzelle Sy for Kyle Negrito hurt because of a poor set that led to a La Salle point to cut the lead down to one (following Guino-O’s service error after the aces). Then the Lady Spikers overhauled the lead only for FEU to even matters at 24-all, with a chance to win it, they faltered again giving La Salle a two-set lead. More to the set, I should point out that Negrito wasn’t the only one who was shaky. Sy herself didn’t set up her teammates particularly well in the second frame. 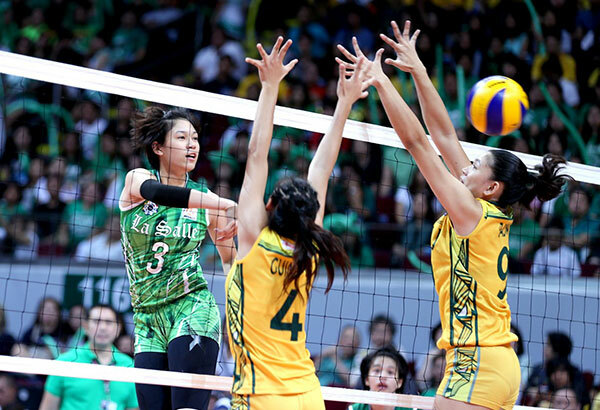 It is sad though for FEU fans because she is a very good setter. The problem though is she is on her final playing year. Offense wasn’t the only problem, they had concerns about their receiving and digging. This season is something this team can build on for sure. They will be a contender for sure next season. However, right now, it’s Ateneo versus La Salle for the UAAP Women’s Volleyball title for the fifth straight year.